This is not the curator’s introduction. At least not in the sense that a curator is someone who conceives the idea for an exhibition and then invites artists to participate. 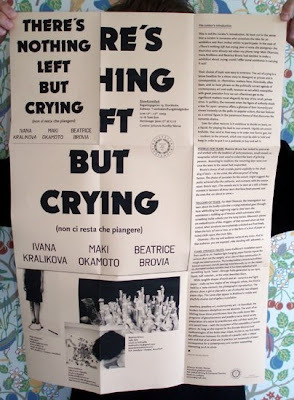 In the case of «There’s nothing left but crying (non ci resta che piangere)» the thematics were already set when my phone rang: Maki Okamoto, Ivana Kralikova and Beatrice Brovia had decided to make an exhibition about crying; could I offer some assistance in carrying it out? Their choice of topic was easy to embrace. The act of crying is a brave headline for a show: easy to disregard as private and inconsequential, as «feminine» matters have, historically, often been, and no buzz phrase on the politically correct agenda of contemporary art and craft; however an act which exemplifies with great precision how we can oftentimes get to the significant matters most elegantly by way of the small, private ones. In politics, the moment when the figure of authority sheds a tear for open cameras offers a glimpse of their humanity and shows instantly on the polls. In popular culture, the tear features as a central figure in the paramount theme of that discourse: the romantic drama. Even for other reasons is it ambitious to decide on tears, on a liquid, for playing the lead in your artwork. Liquids are uncontrollable, they tend to float away or to enter new forms: gas, ice – contrary to the artwork, which one must be able to hold and keep in order to put it on a pedestal, to buy and sell it. VESSELS FOR TEARS. Beatrice Brovia has looked to past eras and worked with the tradition of lachrymatories, small vessels or receptacles which were used to collect the tears of grieving persons. According to tradition, the mourning days were over once the tears in the vessel had evaporated. TRIGGERS OF TEARS. For Maki Okamoto, the investigation has been about the bodily cycle that a crying individual goes through: from withholding her beginning urge to shed tears she experiences a building up of tension which culminates when something inside unlocks and the lump bursts. Okamoto’s pieces are embodiments of the «trigger» of that moment when we lose control, when emotions are explosively unlocked and float freely. When the lock (of wax or iron, or in the form of a knot of paper or twine) clicks open, the chain falls. Okamoto: «The key and audience varies at any time». And to that audience, you are exposed. «Me standing still, ashamed…». TEARS: STRANGE FRUITS. Ivana Kralikova’s installation spans from earth to air. Feather-light hanging paper frames repeat the colours (but not the weight) of an absurd floor construction in rough recycled ceramics. The trolley/military structure/architectonical rudiment stands peering mischievously up on the viewer. Its damaged surface testifies that it has been splashed with something liquid. Tears? «Strange fruits generated by our eyes, liquid, half material», as the artist describes them. While tangible shapes of earth and air – ceramics and light paper – make up two angles of her triangular whole, the third is held by a meta-element, the photographic reproduction. The photos show a girl at play with a set of colourful, tear-shaped paper clips. The same clips appear in Kralikova’s mobile and playfully elusive out-of-gallery installation. Jewellery, jewellery art, contemporary art – in Konstfack, the borders between disciplines are not absolute. The work of exhibiting these three practitioners from the crafts-based MA programs of glass/ceramics and jewellery came about as any preparation of a show by practitioners who call their work fine arts would have – with the exception of the wearability of certain pieces. As long as the respect for the discrete histories and methodologies of the fields stays intact, it’s fair to say that today, the differences between the studio of a jeweller with a critical vein and that of an artist are in practice not necessarily of major consequence for a contemporary arts curator researching interesting work to show. June 18th: Thanks to all our guests for a wonderful opening yesterday!